The Belt Loop Pouch keeps your 4" x 6" notebook within reach anytime, along with extra room for gear, maps ,pencils flashlight etc. 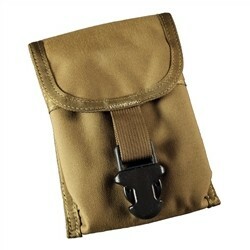 Equipped with a foldover flap with buckle closure, belt loop mounting in sturdy tan canvas. The CORDURA® fabric Pouch fits the 4" x 6" top spiral Journals as well as other essential gear. It has a rugged buckle closure and waist clips.